A Nebraska woman is the first patient in Colorado to receive an implant designed to help patients with sleep apnea. "I guess I'm a trailblazer," said Anita Kitt, who said she was diagnosed with obstructive sleep apnea in 2013. "I was having migraines five out of seven days and that was destroying my life." Sleep apnea also has serious, long-term consequences such as high blood pressure, heart disease and stroke. Traditionally, CPAP machines are the most common treatment for sleep apnea, but not everyone can tolerate the device. Kitt had tried everything from a CPAP (Continuous Positive Airway Pressure) device ("I called it the beast under my bed," she said with a shudder), to taping her mouth shut. Two weeks ago, she underwent surgery with the Poudre Valley Hospital Sleep Disorders Center to have an implant put into her chest that could drastically change her life. "It's exciting to be the first to do something," said Dr. Matthew Robertson, an Ear, Nose and Throat Surgeon at Poudre Valley Hospital. Robertson said the Inspire implant is not new technology; it is similar to a pacemaker or a nerve-stimulating implant already used to treat epilepsy. Inspire therapy, approved by the FDA in 2014, provides a person relief without a mask, said Dr. Robertson. 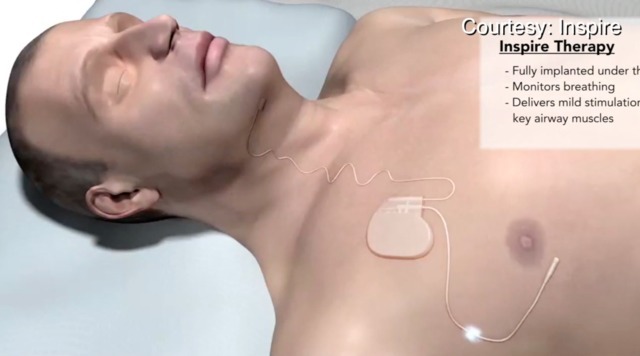 During the procedure, the small device is implanted under the skin in the upper part of the chest. From that device, one wire is directed to the nerve that controls the tongue and another to the rib cage area so it can sense the patient’s natural breathing patterns. Once the device is activated, an electrical stimulus is delivered to the tongue every time the patient breaths in. This gives the tongue tone and prevents it from falling backwards and obstructing the airway. The device can be controlled — turned on at night and off in the morning — by a small handheld remote control. In a clinical trial that implanted the Inspire device into patients with moderate to severe sleep apnea, patients experienced a 68 percent reduction in sleep apnea events, a significant reduction in snoring and significant improvements in quality of life, according to a report in the New England Journal of Medicine. - Suffer from moderate to severe obstructive sleep apnea , which includes an Apnea-Hypopnea Index of 20-65. The AHI is the number of recorded apneas and hypopneas per hour of sleep. - Unable to use or get consistent benefit from a CPAP device. - Not significantly overweight with a total Body Mass Index 32 or less. Those with a BMI of 35 or less should consult with a physician. - Be older than 22 years old. For more information and a video about Inspire therapy, go to uchealth.org/maskfree or call (970) 495 - 8670. Kitt's device will soon be calibrated for just the right current to keep her tongue in place, and she is hopeful she will soon have a full night's sleep. "I don't think any of us could put a dollar value on a good night's sleep," said Kitt.